If you have a query about TeacherStick, please send us a message via the box opposite and we will get back to you. Thank you. No more problems with YouTube access. 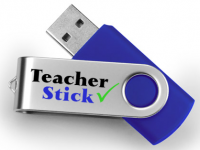 A TeacherStick contains up to 100 quality video clips for your subject area. Works on all Windows computers. Video clips for Primary, Secondary, Art, Biology, Chemistry, Computing, Drama, English Language, English Literature, French, Geography, German, History, Maths, Media Studies, Music, PE, Physics, PSHE, RS, Science, Spanish, Technology.